The One Young World Summit is a unique concept in conferences in that it gathers the brightest young leaders from around the world and empowers them to make lasting connections and to develop solutions to some of the world’s most pressing issues. One Young World delegates are 18–30-year-olds who have demonstrated leadership abilities and a commitment to effecting positive change. Many have already had an impact in their home countries on a range of issues, such as the role of business in society, transparency in business and government, the impact of climate change, global health and hunger relief. The annual One Young World Summit was founded in 2009 by David Jones, Kate Robertson and the Founding Corporate Partner Havas. It is the pre-eminent global forum at which young talent from global and national companies, non- governmental organisations, universities and other forward-thinking organisations are joined by world leaders, who act as One Young World Counsellors. Dubbed ‘Davos for the Youth’ by some, Summit delegates debate, formulate and share innovative solutions for pressing issues currently facing the world. After each Summit the delegates, who are then known as One Young World Ambassadors, work on their own initiatives or bring the power of the One Young World network to initiatives already in existence. Of those in employment, many return to their companies and set about creating change from within their corporate environment. 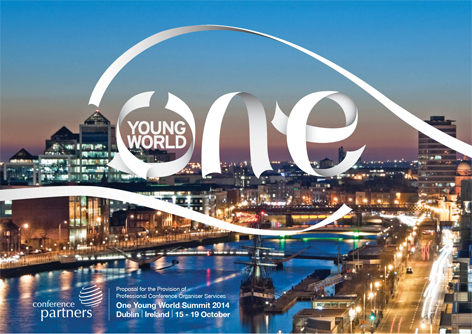 The fifth Summit took place in Dublin on 15– 18 October 2014, attracting 1300 young leaders from 190 countries. Global leaders, including Kofi Annan, Sir Bob Geldof, Antony Jenkins and Mary Robinson, spoke alongside the delegates to address key issues ranging from peace and conflict resolution to global business, and from education to human rights and sustainable development. Ireland was selected as the venue for this high profile and influential conference thanks to the hard work of Bob Coggins, Clara Kelleher and Valerie McGrane, under the guidance of Nicola McGrane, Managing Director of Conference Partners, who brought more than 20 years’ experience of winning conferences for Ireland to the process. The theme of the bid ‘One Thousand Welcomes’ – was a play on the traditional Irish ‘one hundred thousand welcomes’, or Céad Míle Fáilte, adapted to complement the One Young World brand. Significantly, the bid was supported by the President of Ireland, the Minister for Transport, Tourism and Sport, the Lord Mayor of Dublin, the Gaelic Athletic Association, Fáilte Ireland and numerous other key organisations in a concerted and ultimately successful ‘Team Ireland’ approach. David Jones and Kate Robertson highlighted why Dublin was chosen to host the 2014 One Young World Summit. “Whether it was from the North or whether it’s from the great recession, its story is one of a triumph, it’s one of society, it’s one of communal values, it’s one of people… pulling through,” they explained. Other aspects also contributed to Dublin’s win, such as the strength of the bid by the young ambassadors and the city’s position as ‘the capital of new technology for the whole of Europe’. Conference Partners was selected as the local PCO in December 2013 and worked closely with the Dublin Advisory Committee, the One Young World office in London and public relations companies to ensure that the conference exceeded the bid promises and went off seamlessly and successfully. The 3-day programme consisted of special and plenary sessions based on the key topics of: Education; Human Rights; Leadership & Government; Global Business; Sustainable Development; and Peace & Conflict. Speakers included Kofi Annan, four former Latin American Presidents, Dame Ellen MacArthur, Mark Pollock, Caroline Casey, Ali Hewson, Professor Muhammad Yunis, Ronan Dunne and Lord Michael Hastings, to name but a few. The One Young World Peace and Conflict Resolution Project highlighted Ireland’s unique history of conflict resolution and explored lessons learnt from the Northern Ireland peace process. With half the One Young World community living in a country affected by conflict, a series of sessions led by Dr Martin MacAleese, Sean Murray, a Sinn Fein member and former IRA prisoner, and Jackie McDonald, Northern Ireland activist and former UDA prisoner, offered delegates from more than 14 conflict-affected countries such as Iraq, Israel, Palestine, Ukraine, Kashmir, South Sudan, Sudan, Somalia, Afghanistan and Pakistan a platform to share stories and develop ideas for strengthening efforts towards conflict resolution in their own countries. An innovative aspect of the Summit programme was the external breakouts that took place across 26 separate sites in Dublin on the Friday afternoon. Delegates pre-registered for their breakout of interest and were then transported by bus or on foot in groups of 30–35 people to an off-site location for their chosen session. Each breakout was hosted and organised by a company or organisation, and this unusually large-scale, offsite activity was co-ordinated by Conference Partners, with each hosting company/organisation providing lunch, the venue and an exciting interactive programme to delegates. The range of hosts included Google, Facebook, KPMG, Diageo, Kanchi, ESB International and Dublin City Council, further reinforcing the ‘Team Ireland’ aspect of the conference as well as the relevance of the Summit to today’s business, public sector and charitable communities. As part of the Summit’s promise to give delegates a real introduction to the Irish way of life, and to live up to its legendary reputation for hospitality, Dublin welcomed One Young World delegates with a ‘One Thousand Welcomes’ tour. Small groups of delegates were introduced to a young Dubliner, who then took them on a ‘local’s tour’ of Dublin, enabling them to see the real sights and sounds of the city – not just the ones on the tourist maps, but the authentic fabric of Irish life. Guides included staff or student volunteers from the organisations hosting the breakout sessions; although they were provided with briefing notes and suggestions for itineraries, the idea was that the guides took owner-ship of their tours and brought their own personalities and creativity to them. An international press delegation consisting of leading media outlets from around the world attended the Summit, reporting on the event and interviewing the delegates and Counsellors. High-impact coverage was secured across global broadcast outlets including the BBC, CNN, CNBC, Sky News, Bloomberg, Al Jazeera, CCTV, SABC, TV Asahi, RTE and Arise TV. Based on Failte Ireland’s calculations regarding the value of conferences to the local economy, the One Young World Summit generated €1.95 million for Dublin and Ireland. Not only did it place Dublin prominently on the international stage as a leading destination for high-profile conferences, but it also contributed tangible economic benefit. “From the outset, it was clear the gigantic task of hosting the event in Ireland would require the management skills and experience of an international PCO with a wealth of local insight and knowledge,” explained Bob Coggins, who was a member of the Dublin Advisory Committee for One Young World 2014. “The best decision I made was to introduce the One Young World team to Conference Partners, and the result was a world-class conference delivered despite an array of complex visa and logistical issues. The event differed from previous years as the city really got involved, and the delegates used the city as their conference centre, with more than 30 venues used over the 5 days. Thanks to the involvement of world-class Irish performers, local Irish children’s choirs, more than 250 volunteers, the Irish business community and – most of all – an array of Irish suppliers, the One Young World Summit became truly Irish this year.